Low Ceilings For safety, all blades must be at least 7" above the floor, if you have low ceilings (7" to 7 1/2" high) looks for hugger fans. Close – Just under 8' high ceilings If your ceiling is 3" or 4" shy of 8' consider purchasing a fan with a "Low Ceiling Adapter"
Standard – 8' to 9' ceilings Most fans are designed for 8' or 9' ceilings. If this is your ceiling height, you don't need an additional downrod. If your ceiling is higher than 9', refer to the chart above for suggested downrod lengths. The mounting hardware that comes with the fan will attach directly to the downrod. 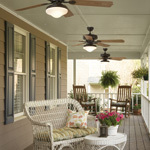 Ceiling fans provide year-round, energy efficient climate control. They also add beauty and interest to your home. Use this guide to establish what you need. 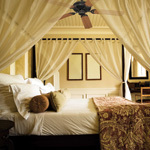 For maximum comfort and air efficiency the size of the fan should be determined based on the size of the room. 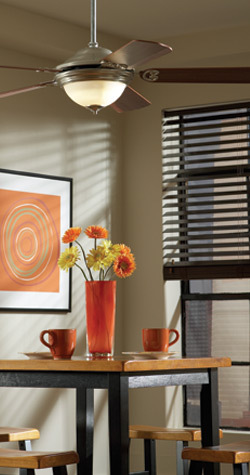 Choose from a variety of styles, colors, energy-star compliancy or price. Note: If you're buying for a bathroom, kitchen or covered porch, choose fans rated for damp or wet environments. 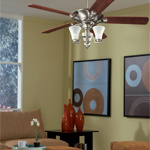 Several of our ceiling fans include lights in the design of the fan. Other ceiling fans can have light kits added to them. You will find light kit options for your fan to be purchased separately. Each fan comes with its own unique set of accessories. These may include downrods or remote controls. Remotes and downrods can be purchased seperately. 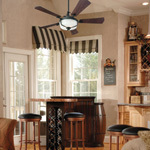 Downrods are needed in order to bring the fan blades down to 8' or 9' above the floor so you can feel the air movement. If your ceiling fan has a light kit, resuce the length by 12".